It's nearly Valentine's Day, and to celebrate this, Abigail from Lady Hunter, Charlotte from Scarlet Slippers, and I have decided to complete a little blog collaboration all to do with valentine's date nights. I absolutely love collaborating with these girls, so I was so excited to do it again! The aim of our collaboration is to hopefully inspire you with different date ideas for you to choose from; A Valentine's Night In, Making The Typical Valentine's Meal Special and Valentines on a Student Budget. So as you can tell from the title of this blog post, my date theme is 'The Typical Valentine's Meal Out'. I do love a good meal out - I mean who doesn't? It's a lovely way to spend time with each other and to enjoy some good food. There are loads of good places to eat out everywhere, however on Valentine's day it is always nice to make it just that little bit more special so maybe steer away from a cheeky nandos or a drive-thru maccy ds? At the moment I live between two lovely cities that have so many lovely places to eat so in this blog post I'm going to share with you some special places to eat in my two home cities; London and Brighton. In addition a meal out doesn't just need to be going out for dinner in the evening; a valentine's breakfast, brunch or lunch can be just as nice if not nicer! In this blog post I have split the Typical Valentine's Meal Out into two parts; going out during the day in Brighton, and then going out in London during the night! This is a wonderful very popular little restaurant located on the seafront. You can eat your delicious brunch with coffee on the beach, or head inside if it gets a bit chilly to sit underneath the archways. Expect avocado on toast, an English breakfast or French toast with a bit of a twist. This is a beautiful little French bistro in Brighton which offers a delicious French brunch menu. Recently named Brighton's favourite independent bistro, expect some tasty French breakfast dishes such as croque monsieur, and lots of eggs! Something a little bit more pricey but also that little bit more special - The Redroaster. If you're looking for a luxury brunch for Valentine's day where you can be surrounded by a beautiful botanical restaurant, then this is certainly the place in Brighton! It definitely has some impressive brunch options. 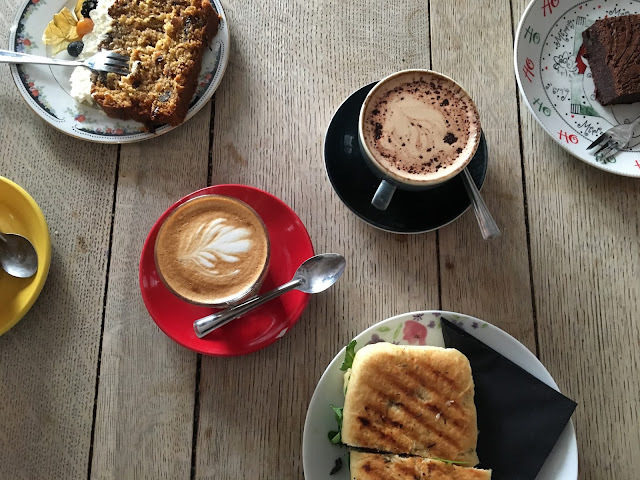 An award-winning small café located in Brighton offers a delicious brunch and lunch menu, as well as amazing cakes and coffee. I would definitely recommend the pancake stacks or the coho french toast! After you're breakfast/brunch/lunch then why not spend the rest of the day walking around Brighton? A look through the lanes and in the shops, a stroll along the beach and to the end of Brighton pier is always lovely to do - or even a stroll through the South Downs just outside of the city. Coppa Club is a luxurious restaurant and bar located along the River Thames at Tower Bridge. The club offers these beautiful igloos which can be rented out for the ultimate classy, romantic date. Enjoy some delicious food, drink and cocktails whilst looking out at the beautiful scenes of London at night. Voted the most romantic restaurant in the world, it kind of needed to be mentioned in this Valentine's day post. This contemporary French restaurant serves you amazing locally sourced dishes whilst you sit underneath the restaurant's beautiful blossom trees and natural interior. This Asian Fusion restaurant is certainly something a little bit different. Located in Covent Garden this restaurant offers delicious Asian dishes, as well as a slightly different way of dining. Tablets are used to place orders at the table, as well as creating wonderful light projections on the table in front of you. There are also options to play games, doodle, or watch videos of the chef's in the kitchen creating your dish, oh and also you can upload photos in advance for your dining experience. One of the most delicious and affordable Italian restaurants in London. Santa Maria Pizzeria is known for serving delicious Neapolitan pizzas made with traditional ingredients and methods. They have two different restaurants to choose from in London, or even a takeaway option if you're feeling a valentine's takeaway night in? They've also recently released a new 100% vegan pizza menu too. After your meal out in the restaurant of your choice, it is so easy to enjoy a walk around London. So instead of rushing to the train station to get the next fastest train home, it's a great idea to enjoy the night a little bit longer to make it special. You could always head to another bar afterwards for some more drinks too?